This soup is like autumn in a bowl! A little bit sweet, a little bit spicy – smooth and comforting on a cold dreary day. 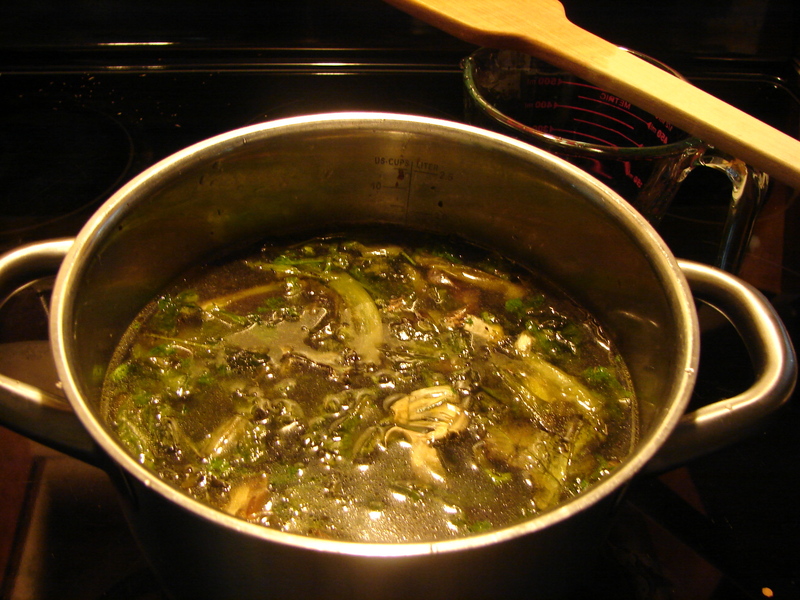 I made a broth first, and let it sit on the stove most of the afternoon, warming the kitchen and making everybody hungry! Here’s MF Doom’s Ginger to listen to while you cook. I make vegetable broth by warming olive oil in a saucepan, and then adding roughly cut shallots, garlic, carrots, and then whatever vegetables I have in my home at that moment. I added rosemary and thyme, some lettuce leaves, some parsley, a few mushrooms. I like to add a handful of lentils, any kind, to add depth. I add a dollop of marmite and a teaspoon of tamari, to add some meaty saltiness. You can add tomatoes, potatoes – whatever you have! I let these all get coated in oil and wilty. Cook them about 5 minutes. And then add as much water as the pot will comfortably hold with room to boil. 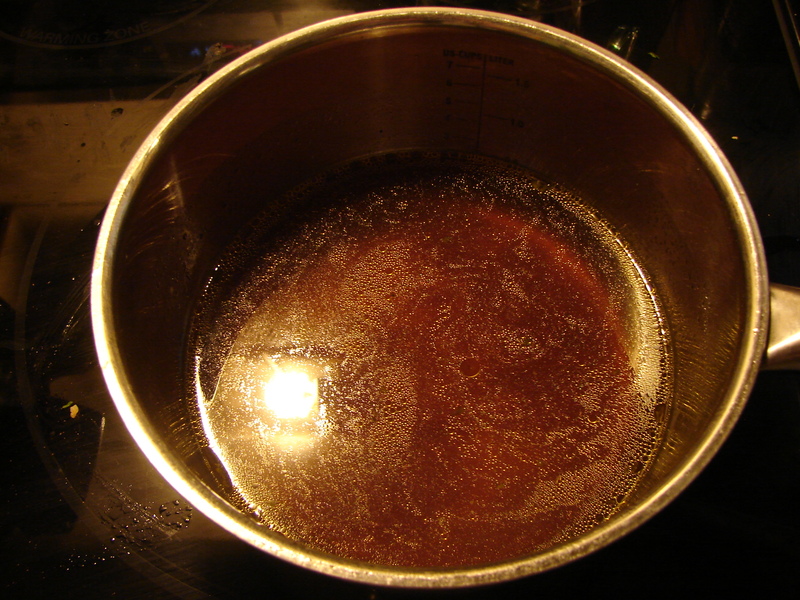 Bring it to a boil, and then reduce the heat to very low and simmer for half an hour or several hours – however much time you have! At the end taste it and add as much salt and pepper as you like. 1. 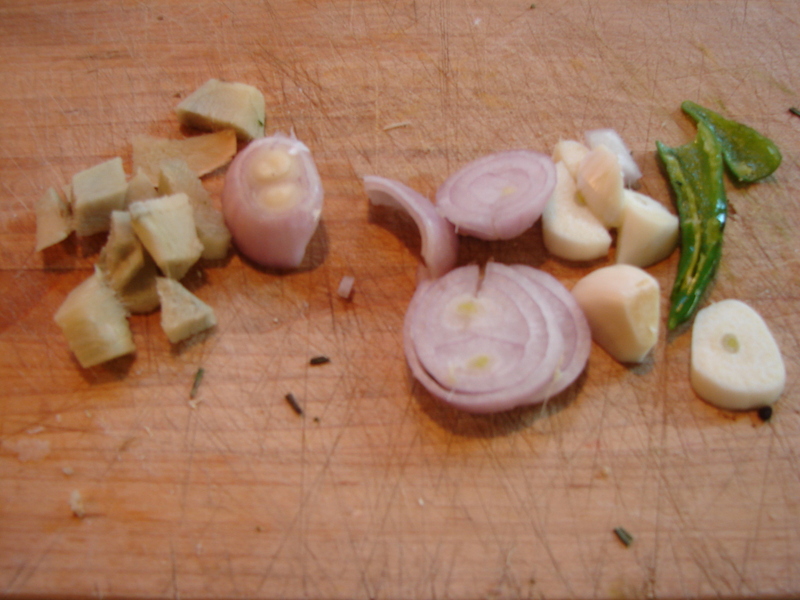 Chop the hot pepper, the shallot, the garlic and the ginger very very finely, so that you almost have a paste. (you can use a food processor for this) If you don’t have a hot pepper, add some cayenne or red pepper flakes later. 2. Warm the oil and butter. 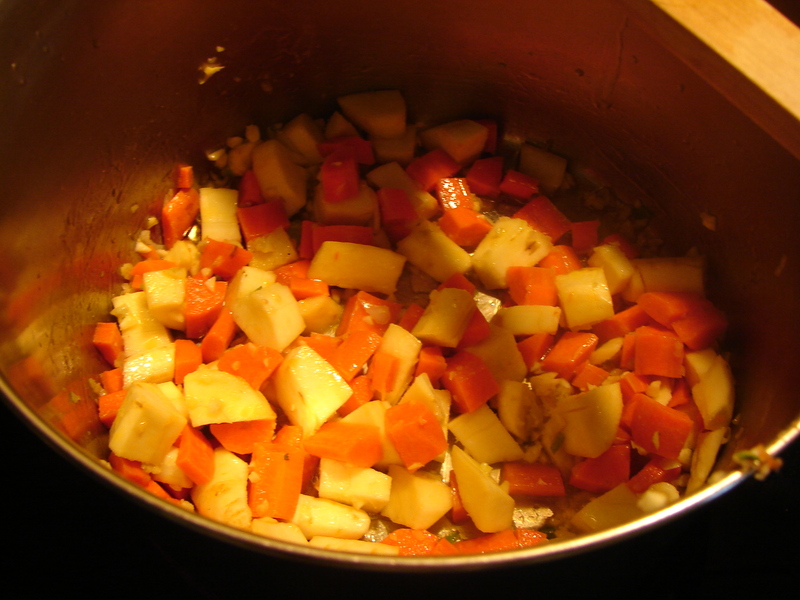 WHen the butter has melted, add the parsnips, carrots, and the ginger/garlic/shallot/pepper mixture. Let them cook, covered, until the oil is mostly absorbed, and the vegetables are starting to get mushy. 3. While you’re cooking the vegetables, toast the spices for a few minutes until they’re aromatic, and then grind them in a coffee grinder. (Your coffee will have a mysteriously spicy flavor the next day. 4. Add the pumpkin and the spices to the pot. Stir them in well, and let everything cook for a few minutes. Then add broth to cover all the vegetables by about an inch. I think I added three cups, but you can adjust for the size of your veggies. 5. Bring to a boil, and then lower the heat and simmer for half an hour or 40 minutes, until the vegetables are very soft. 6. Add the butter and lemon juice, and then blend the soup till it’s quite smooth. Taste, and then add plenty of salt and pepper, or cayenne or lemon juice, till you get a nice sweet/hot balance. 7. I serve it with a swirl of pesto sauce, but you could garnish it with basil leaves or cilantro, if you don’t have pesto. 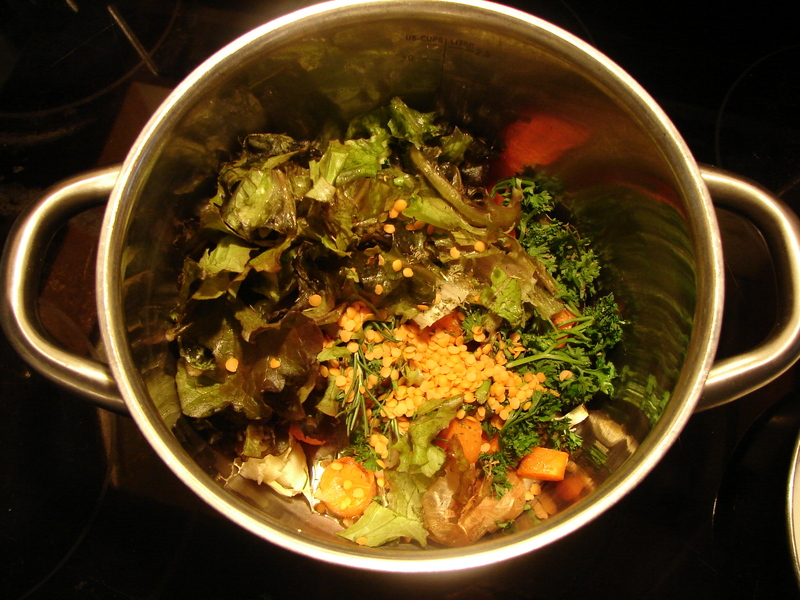 This entry was posted in recipe, soup and tagged ginger, parsnip soup, pumpkin soup, vegetable broth by Claire. Bookmark the permalink. I’m on a two-bus commute back to my in-laws, the run is going down behind the Pennines and this is making me hungry. In a good way ! A two bus commute is not a pleasant thing. I hope you have something warm and tasty waiting for you at the other end. Ohhhh this looks wonderful. And the people I know who don’t like parsnips won’t even be able to tell. looks great, Claire! 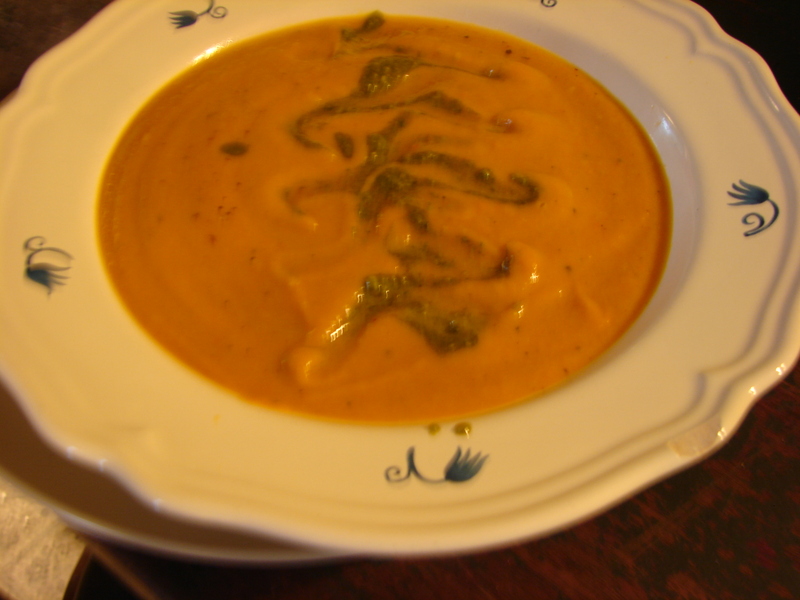 I have used a little pumpkinseed oil to drizzle over soups like this. oops, I was outside the bounds with the pumpkinseed oil as that is not what most people have in an ordinary kitchen. Love the photos – they are great. Hello, Joan! So glad to see you here! I think that what’s ordinary is whatever is in your kitchen! So pumpkinseed oil sounds wonderful!!! !